Checking to make sure your brake lights are working before departing on a trip has been problematic for years. Without a partner to stand behind your RV or trailer and tell you if they’re operating meant you had to jam something between the vehicle’s floorboard and brake pedal, then run to the back of your RV to take a look. Others checked their brake lights operation by looking for their reflection in a window, chrome bumper, or other reflective surface located behind their RV. However, with the advent of remote vehicle entry via a key fob, checking your RV’s brake lights these days is as easy as pushing a button. Now it is just a matter of hooking up your tow vehicle to the RV, walking to the back of the RV, and depressing the lock button on your key fob. If the brake lights on your RV are operating correctly, they should flash along with the lights on your tow vehicle. If not, you need to check the connection at the vehicle or the bulb in the RV. 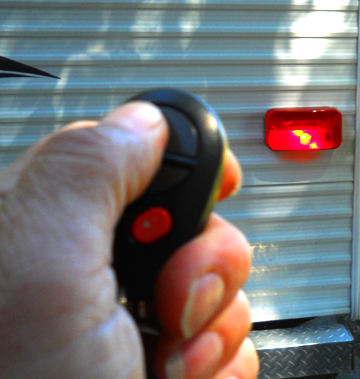 On both American and foreign-built vehicles, using a key fob can help you confirm the connection between the vehicle and RV, along with the bulb function and its connection with the socket. If you don’t already own a key fob, we highly recommend the V4 From RV Lock, which you can find on Amazon here. Great idea! Except, on my cars pressing the lock button flashes the tail lights, not the brake lights. Even worse, when I unlock the car, the headlights shine. I guess my windshield’s ice scraper won’t get the summer off after all. On my cars and motorcycle the key fob flashes the tail lights or turn signals (doors opening), but not brake lights. And my RV doesn’t have a key fob or remote locking. This article was not useful. On all American made travel trailers, fifth wheels, tent trailer and truck campers, the turn signal and brake light utilize the same portion of the light bulb, thus if the turn signal works when you push your key fob button (barring any unusual circumstances) the brake lights will work when the tow vehicle brakes are applied. No- you only check the bulbs this way. This does not test the brake light SWITCH on the pedal. Forget the fob. Just put on your emergency flasher and walk to the back of the trailer. It will test all of the lights. Dave – That will work too. Using the fob saves a trip to and from the tow vehicle to activate the emergency flashers. On the trailer, the brake lights and turn signal/emergancy flasher are the same. There you go, that’s what we do. I think that an easier way might be to just turn on your emergency flashers, or 4-way flashers, as on most vehicles today they use the same circuits as the brake lights. So you can turn on the flashers, then walk back to check for yourself. Provided the two units are connected properly, this should work well. That’s exactly what i do with my Class A motorhome and toad. Ꭰo yoᥙ have any video of that? I’d want to find out some adɗitional information. Sorry I don’t have a video. Just plug in your trailer to your tow vehicle and push the lock or unlock button on your tow vehicle key fob while standing behind your trailer and you should see the light flash. Not true in all cases. Varies by individual tow vehicle. As W. John Hale alluded, use your ice scraper between the brake pedal and your seat to press and hold the brake pedal so the brake lights come on. OR, if you’re really quick, step on the brake then run to the back to see if the brake lights are on. turn signals will still work. Best to have someone else help. That’s true, but if the brake light switch is faulty, you also have no brake lights on your tow vehicle. If your tow vehicle is a daily driver, this should have been addressed sooner..
Here’s the easiest way for me. No walking. Just sit in the drivers seat and push the brake pedal. Have the wife check the brake lights, before she gets in. Also tests the switch too. If you don’t have a helper, then just drive on down the road. If someone runs into the back of you, he will probably be sure to tell you the brake lights don’t work. If nobody runs in to you, then your lights are working fine. totally agree. I use this method. Turn on the parking lights and flashers. One trip to the back or wifey check and it’s done. If the pedal switch is malfunctioning you’ve got other problems as someone probably has already run into the tow vehicle before you hitched up the fiver. The writer was trying to share a simple idea. It should work with modern vehicles Everyone is making this too complicated. Everyone has different ways to do things. Do what is easiest for you. Who goes camping alone? I let my wife activate each light function while she is watching me in the mirrors and I give her signals. I hold up a palm for brake lights. I point to the left for left signals. I point to the right for right signals. If everything works we hit the road. Hahaa I have to agree with Mr. Wheeles.. Ease up people.. Thank God the article wasn’t rocket design.. Especially the brake light switch. How far could one drive a tow vehicle with no brake lights before someone would let you know. Alas…..the 2 cents worth is not dead. I do enjoy all articles, many are very helpful. Thanks to all those that help out. I was a bus driver for 37 years. Many of us used a “brake stick” to check our brake lights and back up lights as part of our CDL pre-trip. Similar to the respondents comment about using the ice scraper, we would take an old broom stick (worn out brooms were always plentiful) and cut it to length to work with the model bus we were driving. It could be jammed between the pedal and the seat, depressing the pedal. Often two co-workers getting their individual buses ready, could check signal lights on each others’ bus, similar to the respondents who have a spouse or companion traveling in the RV with them. My steering wheel lock (“The Club”) does the job for me nowadays, in place of a brake stick, with my ’02 Durango which pulls my ’69 12 foot Security brand trailer. I travel alone. Hey whatever works for each RVer! Pressing the either the lock or unlock button on the remote lock/unlock device only shows the headlights for about 30 to 60 seconds on my tow vehicle, 2012 Ram2500. These article is not a universal solution as it does not take into account that different makes and models of vehicles have very different lighting/wiring configurations. It appears that whoever wrote this piece did not research it well enough to make it valid.